We would like to thank The Oaks At Spanish Fork Golf Course for their generous donation to Huntsman Cancer Foundation. 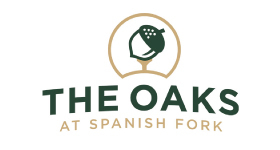 The Oaks At Spanish Fork is an 18-hole, par 72 championship golf course with driving range, putting greens, practice bunker, full-service pro shop and snack bar with catering options. The course is a Mountain/Traditional style with Pencross Greens, Bent Grass Rough and Bent Grass Fairways. It is located at the mouth of Spanish Fork Canyon just off U.S. Highway 6. The facility consists of a full-service pro shop and snack bar to facilitate your golfing and eating needs. The snack bar is run and operated by GreenHollow Catering offering catering options for corporate golf outings, business lunches, and group parties. We would love to have your corporate golf outing at Spanish Oaks so please give us a call at (801) 804-4653 or visit the tournament section of our website for more information. The layout of the golf course was designed by two-time U.S. Open and Masters Champion Billy Casper. The golf course and driving range were both voted the 2nd best places to play and practice by Utah Valley residents in 2009.